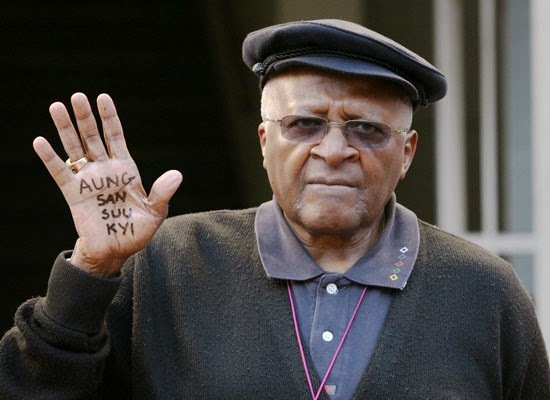 was the score and with Redfearn only getting one point from the last two games it seems that Archbishop Tutu, seen above complete with flat cap, could be in the running should the Leeds owner fancy a change of boss. A brace each for Mowatt and Gudmundsson at Elland Road meant that the Addicks recorded another draw, their ninth of the season. It was disappointing that Igor wasn't on from the start as Harriott, Gudmunsson and Wilson all came into the starting eleven. It seems that a fairly lacklustre game came to life in the second half with Leeds twice taking the lead with excellent goals from Mowatt. Gudmundsson equalised first with a shot from a narrow angle that their keeper should have done better with. JBG's second came from the penalty spot after TBH took a tumble. There were complaints from those of a Leeds persuasion but unless TBH's shirt rode up of its own accord then it looked a fair shout to me. The penalty was dispatched with some aplomb. An injury late on to Wiggins meant we played the last 10 minutes or so with ten men. However, as Mowatt was unable to conjure another goal the score remained two all. Elsewhere the Championship threw up some unexpected results. Bournemouth have been one of the more consistent teams and the Cherries now sit top of the league, well done to them. Reading secured a confidence boosting 3-0 win at home albeit to Rotherham. A tough task awaits on Saturday especially if we are without Wiggins just as he was starting to return to form.